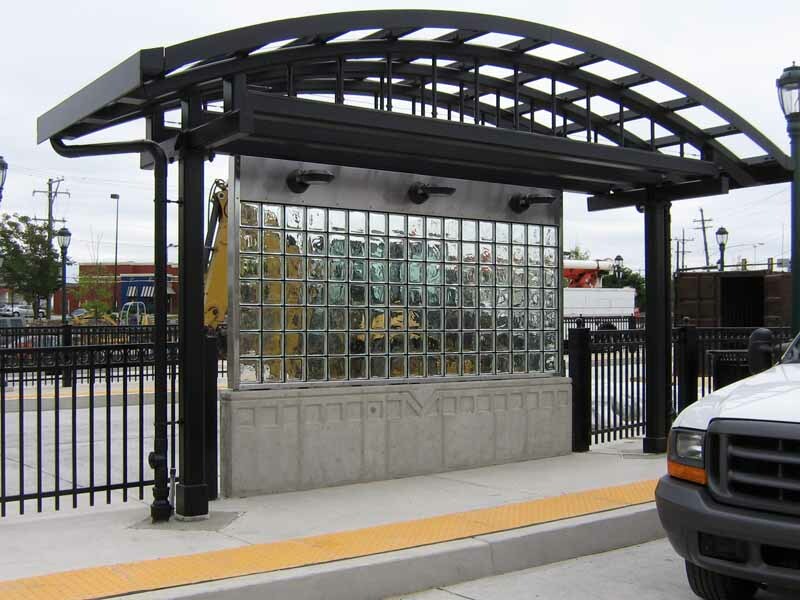 EXTECH offers a wide assortment of solutions for the transit industry, including mass transit shelters, pedestrian walkways, protective windscreens, durable canopies, and parking structures (for auto and bicycle). With more than 40 years of experience delivering systems for the Transit industry, we are well-versed in the assorted requirements and demands of transit structures, and transit regulations. Our systems are built to help transportation authorities meet their bottom line and boost ridership. Our products serve exterior and interior needs, and they offer the durability, vandal-resistance, easy maintenance, long lifespan, and so much more that is vital to transit facilities. Because all of EXTECH’s products are manufactured onsite in our Pittsburgh, PA factory, our systems are compliant with the Buy American mandates of the FAST Act. The GRIDLOCK glass block system is great for transit structures, and can take the form of a windscreen, shelter, partition, or accent wall. It possesses extreme durability that can withstand rain, sleet, wind, snow, and salt. It is also vandal-resistant – graffiti can be removed with spray and wash, and the thickness of the glass blocks prevents breakage. The durability of the GRIDLOCK snap-in glass block system results in applications that can be repaired and maintained with little cost and last for decades. The life cycle costs of these systems are extremely economical. GRIDLOCK provides daylighting which is ideal for transit applications that need lighting and transparency for security purposes – commuters are safer in a well-lit environment, and the removal of blind spots aid security personnel. 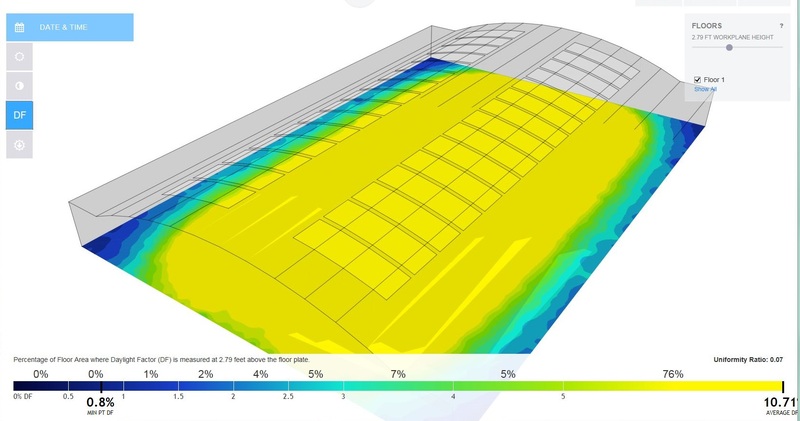 Further, daylighting alleviates energy costs, and lends itself to sustainable building design. The aluminum framing is 100% recyclable. One big advantage of the GRIDLOCK glass block wall system is that, unlike traditional glass block systems, it does not require mortar. GRIDLOCK employs a patented “snap-in” system to hold blocks in place. 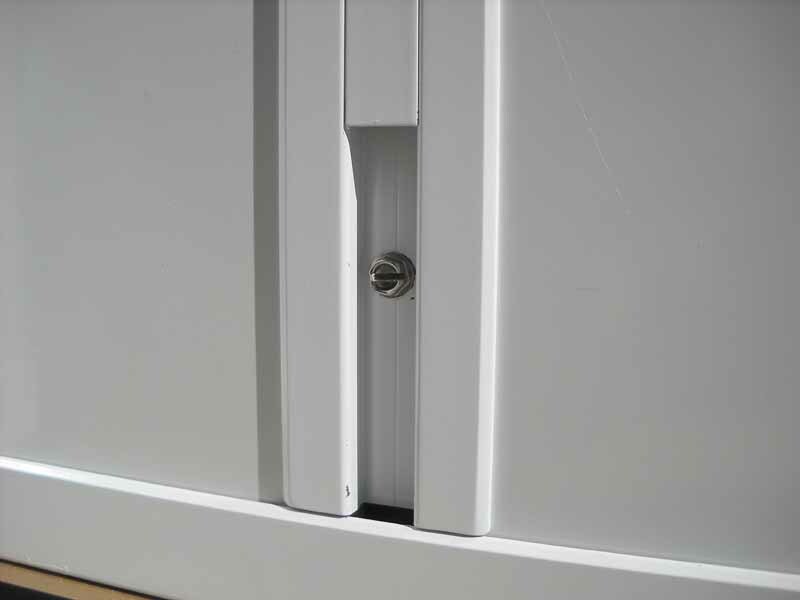 This mortarless, snap-in system drastically cuts down the installation time, and enables easy repair, providing minimal disruption to commuter pathways. The GRIDLOCK wall system can be installed using lightweight and pre-assembled grids, making it especially ideal for renovation work where transit operations must continue efficiently and safely. Further, the GRIDLOCK system can be easily repaired by any maintenance team – no specialty masonry skills are necessary, and individual blocks can be replaced in under 2 minutes without impacting the adjacent blocks. 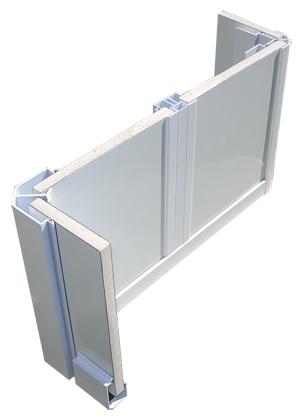 The exposed aluminum frame resists deterioration (unlike mortared joints), and snap-on elastomeric joint cover strips protect the silicone from exposure to UV rays. These attributes of the GRIDLOCK system are especially attractive to maintenance facility groups, who are often part of the transit planning review team and provide input on the types of materials chosen. In addition to the benefits mentioned above, the GRIDLOCK framing has no ledges, thus it will not collect dirt and debris. 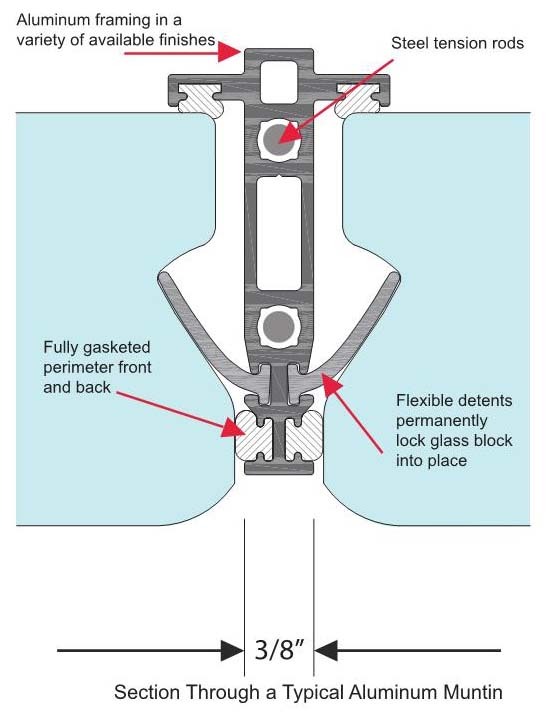 Its joints are fully gasketed, and the fasteners are concealed - both attributes that help with system lifespan. It can be adapted to fit existing openings, and it is capable of long structural spans. 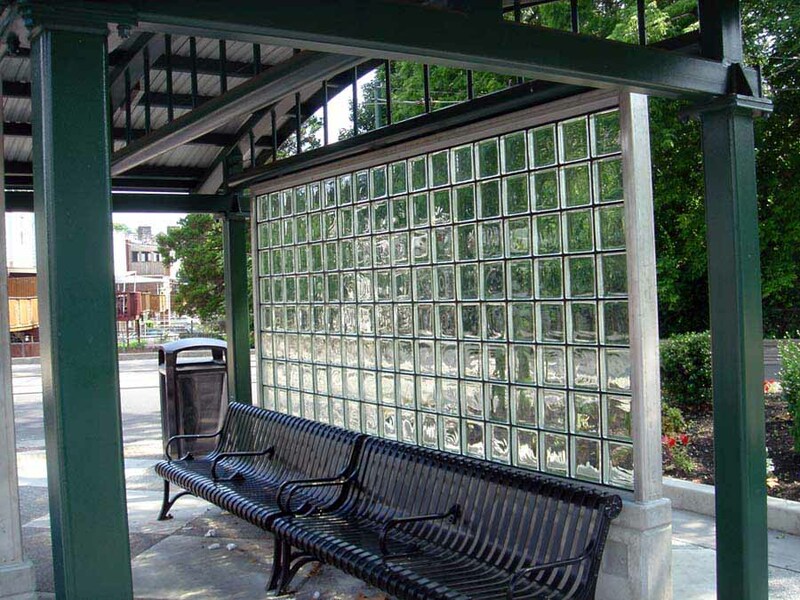 Because transit structures need to offer aesthetic rejuvenation as well as functionality, GRIDLOCK glass blocks come in a variety of sizes and color options, and can be customized with decorative designs. The system is fully customizable to create artistic interpretations, which can lend themselves to Arts in Transit and percent-for-art compliance. EXTECH’s CLEANWALL is a porcelain wall panel system that is great for transit interiors like rapid transit stations and bus shelters. The CLEANWALL offers outstanding vandal-resistance – its porcelain veneer allows easy removal of graffiti (including permanent marker) with simple cleaning products. 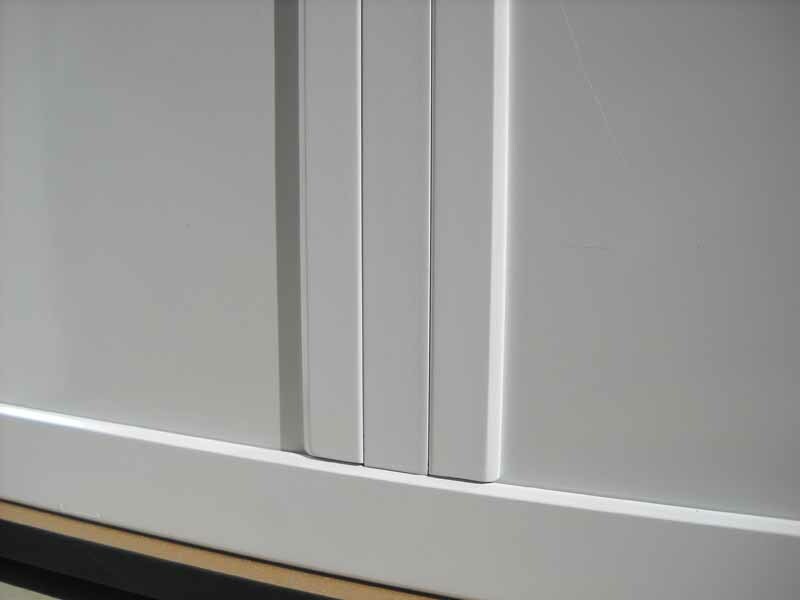 The system offers a smooth finish with covered, rounded corners, enclosed edges, and concealed fasteners, and resists scratching, chipping, gouging, and environmental damage. 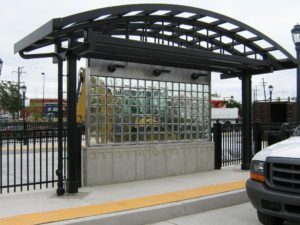 Its non-corrosive heavy-gauge aluminum framing delivers further resilience to vandalism and inclement weather. Fully customizable, CLEANWALL installs quickly and allows individual panel replacement, with framing that can accommodate various lengths and panel widths of 1/2,” 3/8,” or 1/4”. Individual panels can be replaced without disturbing adjacent panels. Its deeper pocket depths and no need for mitered corners further reduce installation costs. The system allows quick access to the structure behind the panel (enabling easy inspection of structural waterproofing and electrical wiring), can be installed over a wide variety of substrates, and is adaptable to wall openings and other field conditions. The CLEANWALL is a low-maintenance and cost-effective solution for transit applications that must deliver a clean appearance and long lifespan in high-traffic areas. 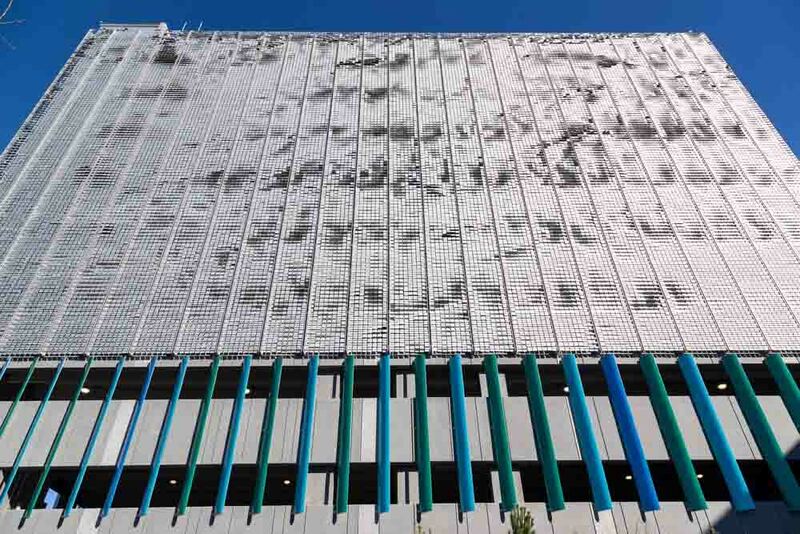 EXTECH’s KINETICWALL is an optimal façade system for standalone or mixed-use parking facilities because it delivers durability, air flow, easy installation, and simple maintenance. Additionally, it permits visibility from the inside while preventing the nuisance of interior lighting spillage. 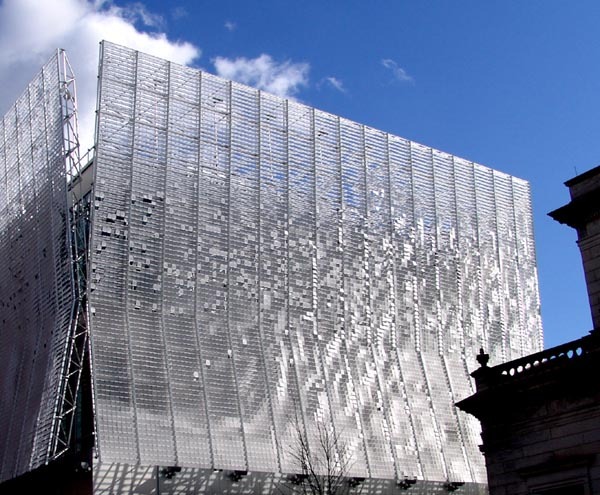 Made of “flappers” attached to stainless steel rods, the KINETICWALL responds to wind currents and ripples to create the look of rolling waves. 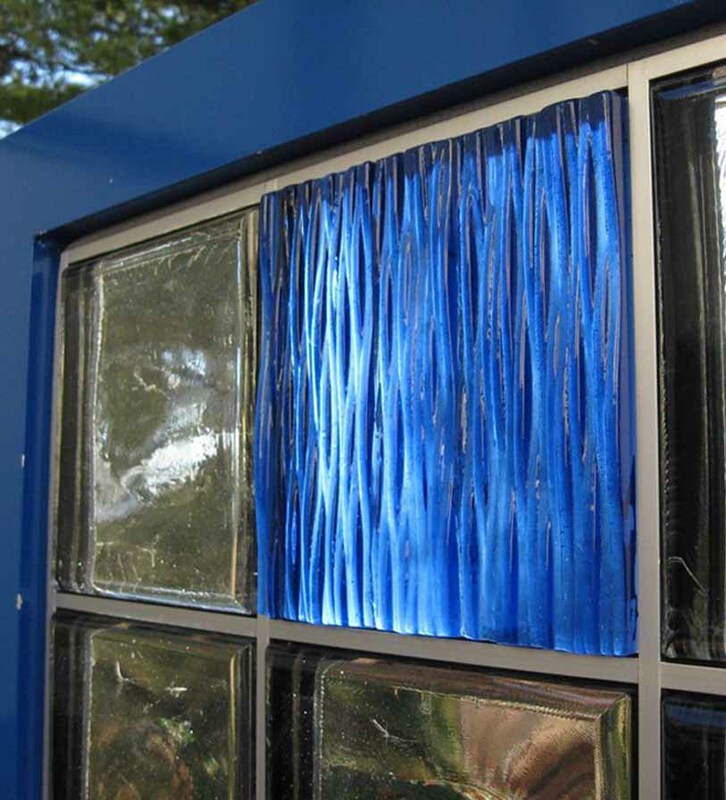 Customizable, the system can be designed to accommodate square or curved polycarbonate, glass, aluminum, or steel flappers, and can be finished with color-shifting paint. 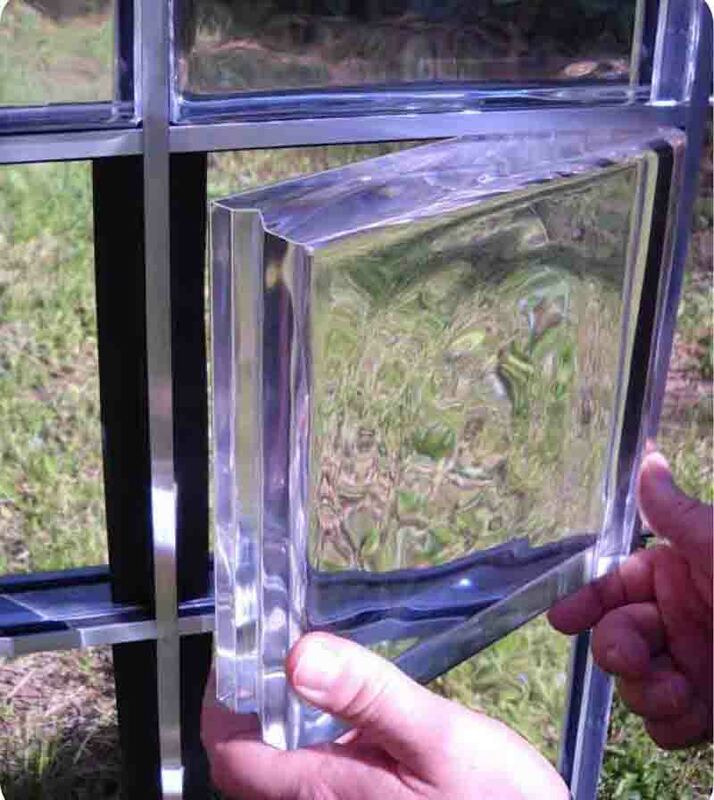 The KINETICWALL is structurally designed to withstand hurricane-force winds, and uses spacers designed to prevent collateral noise from flappers. The need for parking facilities in urban areas continues to increase. Being that these structures are interwoven with the community, there is a demand from municipality planning boards that they be visually pleasing. Arts in Transit and percent-for-art regulations are one way communities aim to achieve aesthetically interesting parking facilities. The visual aspects of the KINETICWALL helps municipalities meet Arts in Transit and percent-for-art compliance, while also delivering enchanting architecture for city-dwellers. One of our most talked about projects is the KINETICWALL for the Massachusetts Port Authority (Massport) parking expansion at Logan Airport. 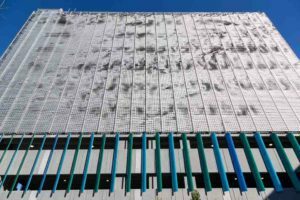 One of the reasons the KINETICWALL was chosen as the façade system for this parking garage was because of its dynamic and eye-catching qualities. Massport realized the garage would be seen by travelers from all over the world, so they wanted to design with a system that would be aesthetically interesting while structurally sound. EXTECH’s SKYSHADE canopies offer the durability and long lifespan needed in transit applications. They hold-up in wind, rain, sleet, and snow, and resist peeling and deterioration caused by UV rays (unlike canopies made from fiberglass reinforced panels). The SKYSHADE systems are designed with lightweight and fully-fabricated components that install easily, which makes for quick project deployment, simple maintenance, and cost-savings. 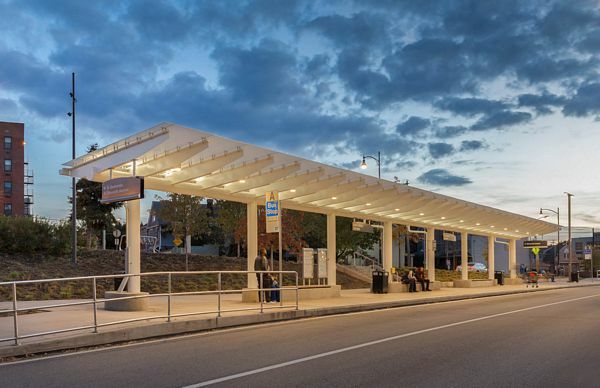 The SKYSHADE can be used to cover pedestrian walkways or serve as standalone canopies at bus stops, bike shelters, and above-ground rapid transit stations. Additionally, the system can be customized to match the streetscape or surrounding architecture. 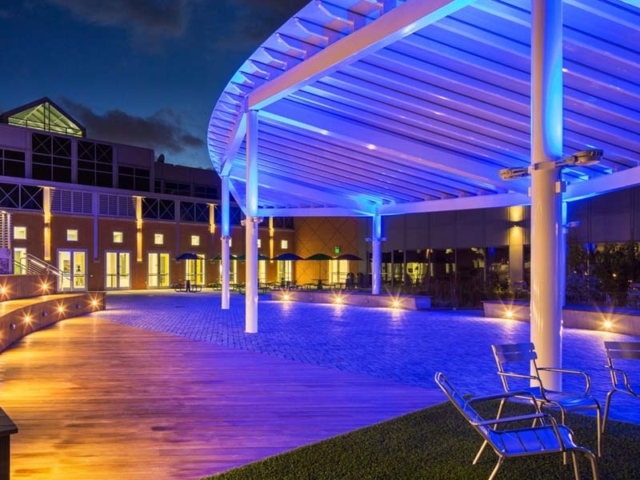 Our SKYSHADE canopies can utilize standing seam cellular polycarbonate, solid monolithic polycarbonate sheets, or flat-sheet multiwall polycarbonate captured by aluminum framing, all of which are 100% recyclable. The polycarbonate comes in a variety of translucencies and colors, tailored to meet the needs of the application and reduce glare. 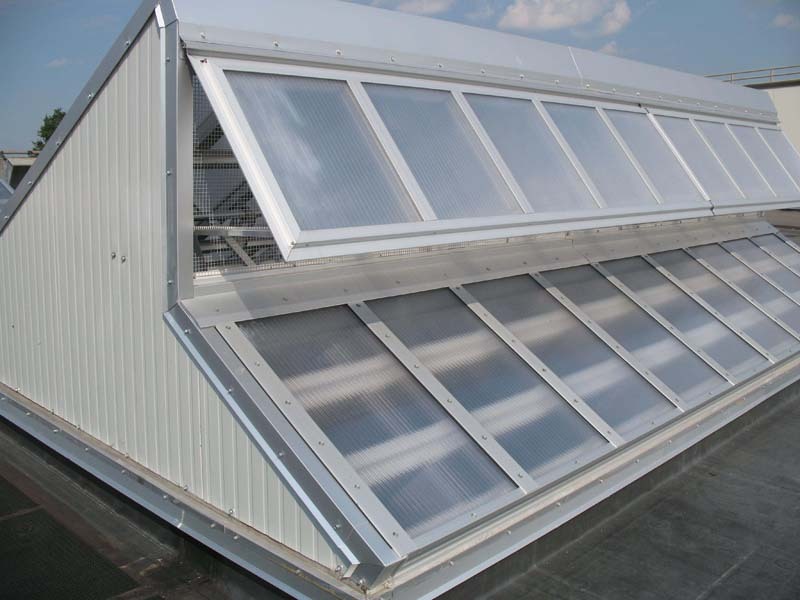 The SKYSHADE 3100 can utilize polycarbonate panels up to 54 feet long which eliminate the need for leak-prone horizontal joints. EXTECH’s SKYGARD skylight systems offer overhead daylighting and have been used in transportation depots to maximize internal illumination, reduce operating costs, and deliver cost-effective energy efficient building upgrades. The SKYGARD can be tailored to your needs, and can even have PV solar panels incorporated so the facility can have its own micro-grid. Our SKYGARD skylight systems are based around a unique system of overlapping joinery and internal gutters that provides an extremely leak-resistant skylight. Our SKYGARD 3700 system has undergone a complete battery of air, water and structural test, and provides superior performance numbers. The 3700 system can incorporate both glass and cellular polycarbonate skylight glazing to meet your projects specific requirements. 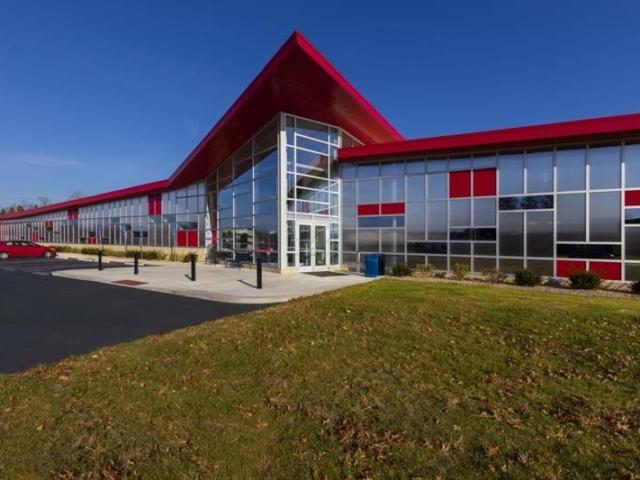 The TECHVENT 5300 window system delivers natural lighting and massive ventilation, which is key for reducing energy costs in transportation maintenance facilities. Buildings that house heat-generating motor vehicles and equipment require air flow to reduce demand on the HVAC system. The TECHVENT 5300 is a window system with proven capabilities when it concerns improving the energy-efficiency of a building’s HVAC system. 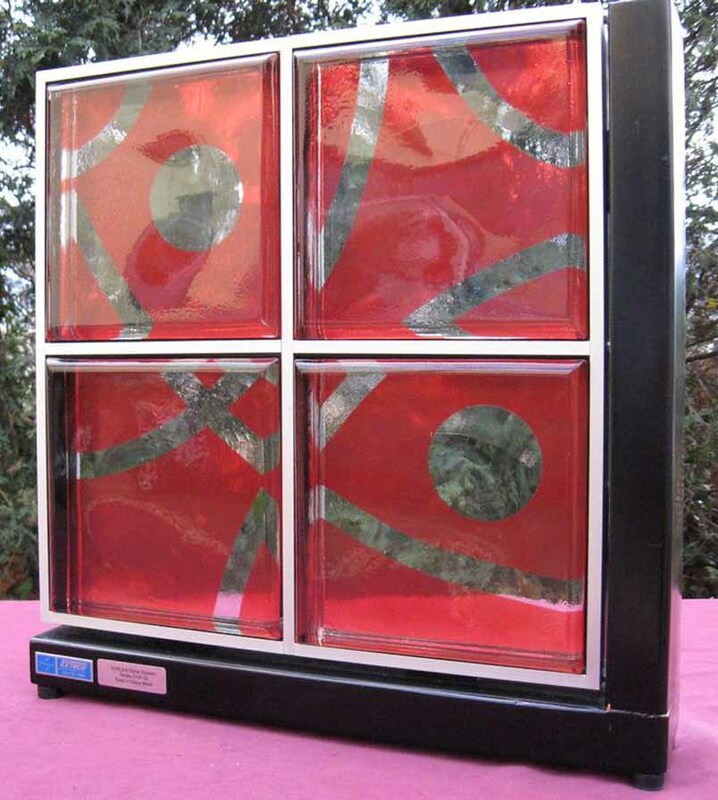 This top-hinged window system was designed to remain open during normal rainfall so it can provide ventilation regardless of exterior weather conditions, and it can be implemented with insect and bird screens. The daylighting delivered by the windows further helps energy costs. The TECHVENT 5300 can be installed in an individual punched opening or in continuous runs of up to 150 feet. The system can be operated with optional manual or electronic control systems, and can be tied to the building’s HVAC control system. By integrating the window controls into an HVAC system, natural ventilation can be leveraged while still admitting daylight into the building. 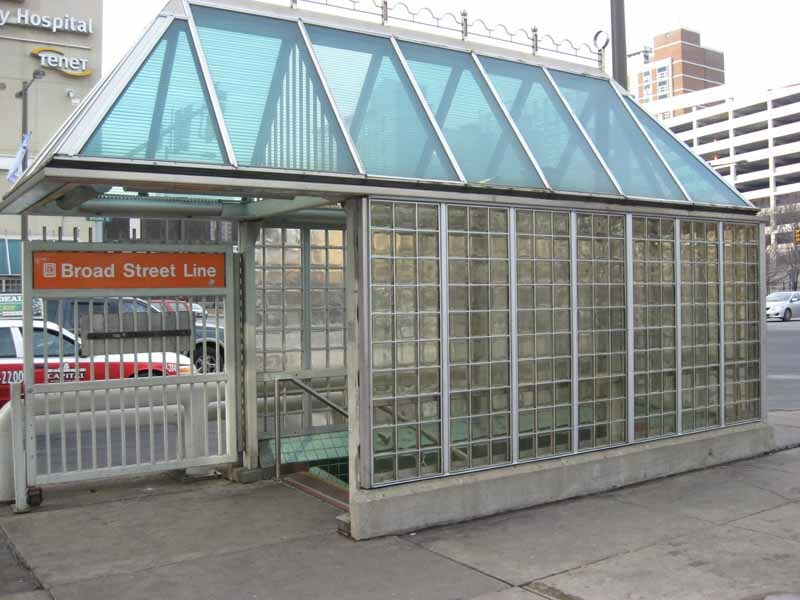 EXTECH can perform daylighting studies for large transit depots or small shelters; there is no size limit. These studies ensure the structure harnesses the optimal amount of daylight, prevents solar heat gain (and a heavy demand on the HVAC system), and diminishes glare. Collaborating with EXTECH early in the design process helps simplify the design experience and maximize the benefits daylighting can deliver (energy-savings, occupant comfort, and occupant safety). Our engineers simulate transit designs in a virtual setting that analyzes the orientation of the structure. This analysis predicts how much natural daylighting can be realized, and allows architects and lighting designers to determine if supplemental electrical lighting is needed. EXTECH’s GRIDLOCK and CLEANWALL are designed to deliver superior vandal-resistance. 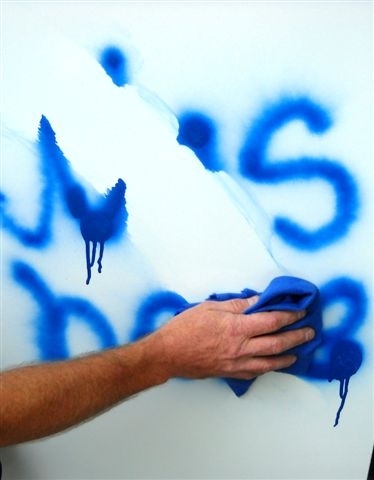 They repel graffiti (including permanent marker), and are easy to clean with simple spray and wash. The GRIDLOCK and CLEANWALL systems also allow easy maintenance, and individual blocks and panels can be replaced without disturbing the adjacent pieces. Special skills aren’t required – any maintenance crew can fix these systems. Additionally, the aluminum framing of these systems can be relocated and reused. EXTECH’s daylighting and specialty façade systems are built for long-lasting value and system lifespan. Unlike other daylighting providers, our framing is fabricated to meet the needs or your specific project – this results in tougher durability and longevity. 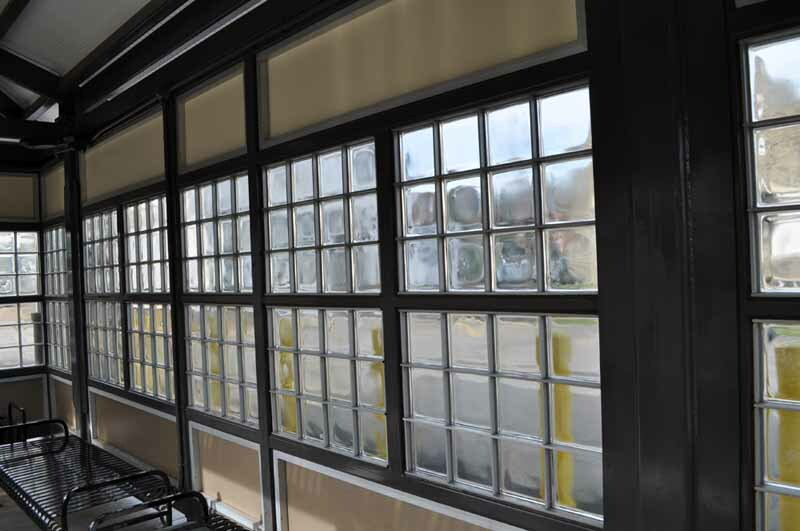 Additionally, if your transit application utilizes an EXTECH polycarbonate daylighting system, the polycarbonate glazing will deliver a longer system lifespan than glass or fiberglass reinforced panels. 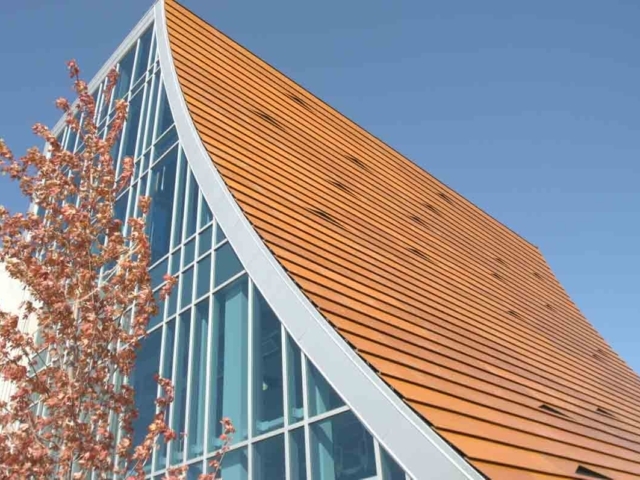 Polycarbonate is much more impact-resistant than glass, and is not at threat of “fiber-bloom,” a yellowing deterioration that occurs with Fiberglass Reinforced Panels. Transit applications must offer the highest levels of safety and security not required of many other building forms. GRIDLOCK utilizes clear glass blocks that harness daylighting and allow visibility, making them safer to occupy and patrol. Clear polycarbonate and glass can also be used with our LIGHTWALL façade systems, delivering the safety and security of daylighting. 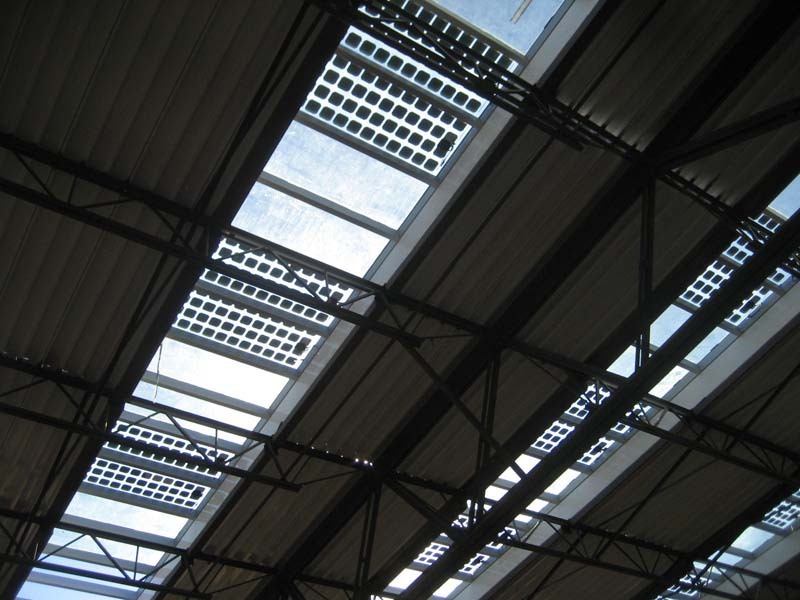 Additionally, EXTECH’s daylighting systems meet industry flammability standards and offer polycarbonate glazing options that carry a Class A fire rating (the best there is). We are knowledgeable in various municipal codes, and can walk you through the standards your application will be required to meet. EXTECH is heavily experienced in working on Transit projects, so we know it is some the most logistically difficult work in the construction industry. The planning, design, and construction of transit applications involve multiple levels of stakeholders, often with competing interests. We can provide assistance throughout the planning process that helps with the execution of required tasks, quickly delivers information, and helps you cut through red tape. We also provide system mock-ups so you will know how the system interacts with the application’s environment, and get a hands-on education with how the system is installed. For all Transit construction, planners, architects, engineers and contractors have to contend with typically congested and constrained urban areas. The logistics of getting materials into and out of these sites with limited lay-down space adds another layer of difficulty, and can have a major impact on the material selection and detailing. This is especially true regarding renovation work, where Transit operations must continue efficiently and safely. EXTECH’s GRIDLOCK is ideal in this regard - it can be installed using lightweight, pre-assembled grids without heavy equipment. Our engineers are experienced in helping clients with short deployment schedules (link to Logan airport hangars case study) and limited construction space. The full fabrication and detailing of our systems also makes them quick and easy to install. There are many teams, often with differing objectives, that take part in planning Transit projects. Many demands must be placated to implement effective applications, thus the planning cannot take place in a silo. Through our decades of experience working with the Transit industry, we are well-versed in the intricate needs of Transit projects. Transit stations and structures are the authority’s best advertising, and we work with all stakeholders to create applications that are robust, beautiful, and enhance the community. Daylighting systems enable Transit clients to save on energy costs by incorporating natural light illumination into their facility, reducing the need for supplemental electric lighting. Our systems’ daylighting capabilities and 100% recyclability lend themselves to LEED certification and sustainable Transit design. The Massachusetts Port Authority (Massport) was in need of a modern parking facility for their Central Parking Expansion at Logan International Airport.